Is volcanism sufficient to explain the onset of the Little Ice Age? January 31, 2012. As has been documented on this website, two important questions have inspired interdisciplinary debates about the origin of the Little Ice Age. The first: when did it begin? The second: why did it endure for so long? Now an important new study purports to answer both questions. Publishing in the journal Geophysical Research Letters, a team under Gifford Miller have used vegetation entombed by expanding ice sheets to argue that increased volcanism was the primary culprit behind a global cooling between 1250 and 1300. That argument has been made before, but as the study authors admit explosive volcanoes, by releasing aerosol particles into the atmosphere, usually only cool the world's climate for a few years. Hence, they have been considered insufficient to explain the longevity of the Little Ice Age. 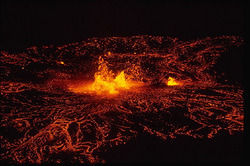 However, Miller and his fellow researchers have used a transient climate model to reveal that at a time when Earth’s orbit stimulated low summer insolation across the Northern Hemisphere the initial 50-year episode of four sulphur-rich volcanic eruptions was sufficient to dramatically expand ice cap growth. Increased ice reflected more sunlight into space and weakened the Atlantic Gulf Stream, allowing colder temperatures to endure long after the volcanic eruptions ended. Unmentioned in most media reports: the authors do acknowledge that reduced solar radiation exacerbated the effects of volcanism, but conclude that a Little Ice Age would have occurred regardless of solar activity.